Although they’ve been going for quite some time, The Walking Dead propelled Telltale into the limelight like never before, so it was with pleasure that we recently had chance to chat with Kevin Boyle (executive producer) and Kevin Bruner (co-founder, executive producer) at the studio. You’ve had tremendous success with The Walking Dead, how has this changed Telltale Games and your ethos? Bruner: It’s been kind of the culmination of a long march over the years, a lot of things came together. So it’s changed I think, in that, it proves that what we’ve been trying to do all these years has kind of started to click and is starting to work. We’ve certainly evolved over the years as well. We keep pursuing the same goals, like making stories and characters really interesting in games, episodic gaming, I think it’s finally starting to come together. So do you think it’s that you’ve changed, or that the market has changed? Boyle: I think it’s been the perfect storm of the timing for Telltale, and our technology, and the skills of our people, and the readiness of the market for this episodic digital model. 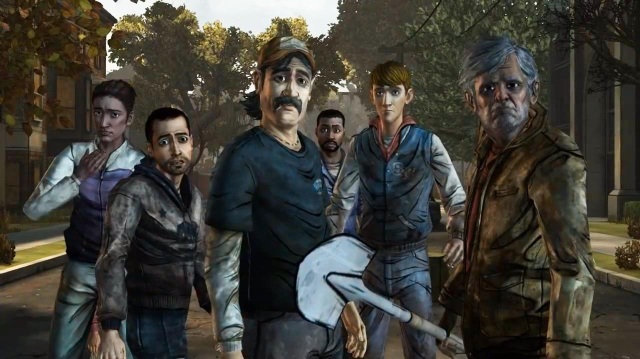 I mean, Telltale’s been doing all along, but it is still a little unusual – and it’s just like lightning striking with The Walking Dead, and us being there to take advantage. I know you’ve announced that we’re going to get a new The Walking Dead snippet, before Season 2. Will we be carrying on where we left off, or how is that going to work? Bruner: We don’t have much more to say about it, other than, we got to The Walking Dead by doing a bunch of experiments in storytelling, and the way you could interact with games, characters, and so we came up with this great storyline and way of playing the game and the choices – the tough choices matter – but we left a little on the table of thing we wanted to do as well, that didn’t fit into that framework. So we’re re-visiting some of those things a little bit, playing around with the way you can interact with stories a little bit and I think we’ll be talking more about that in a couple of weeks. I’m assuming we’re going to see some of the same characters? Clementine’s got to be there, right? Bruner: I don’t think I should really say who’s gonna be there. Boyle: I think you know, we’ve done really well by keeping the details of the narrative pretty close to our chest so that people can be surprised by it and experience it for the first time, and I think we’re gonna continue working in that model for the time being. You have other projects between now and The Walking Dead Season 2, would you like to tell us a little more about them. Bruner: Yep! So we’re working on a game based on the graphic novel, Fables by Bill Willingham, and that is coming out. We’ve been working on it for a while, we haven’t talked much about it because The Walking Dead has been the big game for us. But we’ll be definitely talking more about that over the next couple of weeks. It’s looking amazing. It looks like an ink graphic novel come to life. So it’s got a very distinct look and it takes some of the things that made The Walking Dead special, and kind of evolves them further. And you know, it’s not zombies, it’s Bigby Wolf in Fabletown in New York, so a whole different set of circumstances, but a lot of similar feeling of what you got from playing The Walking Dead, you’ll see in the Fables game. Incidentally, you’re not a massive team, are you? So is it the same people who were working on The Walking Dead, working on the Fables title? Boyle: There’s some crossover. 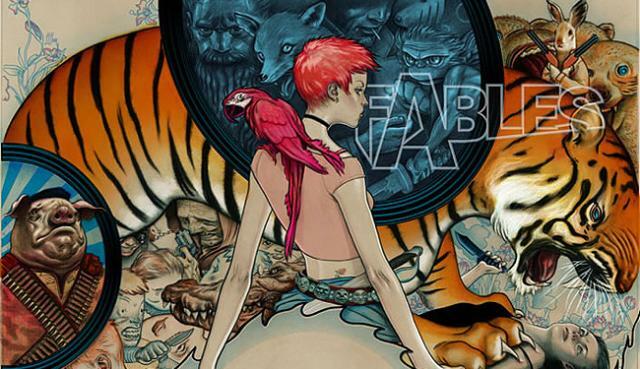 It’s not The Walking Dead team moved to Fables, but it’s definitely the case that the company is moving people back and forth as it makes sense, from one project to another, and so that knowledge that came with building The Walking Dead has a chance to seed Fables, in a way that makes sense for that franchise. People want to know a bit more about you guys. What are you playing right now? Boyle: I’ve been playing a lot of Borderlands 2. That’s in heavy rotation. Boyle: A lot of single player, and a lot of pick-up games as well. I find the multiplayer is amazing and it’s pretty fast paced, but everyone once in a while I have to back out to single player, just to give myself some time to plan my skills, and figure out what I want to do with my weapons and such. So I’m having a good time with that. Boyle: Oh, I’ve been diversifying! So I’ve got a handful of characters that I play with particular people, that are off-limits. So they stay largely at the same level, so I’m not at the upper levels, but I’m in the 30-range with a couple of characters, and having a good time with it. 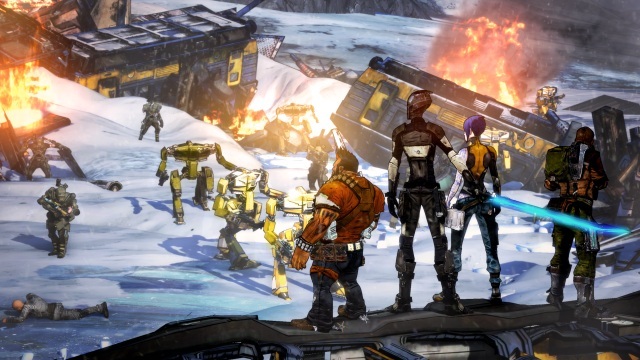 Bruner: I’ve been playing a bunch of Borderlands 2, not as much as these guys. Journey, those are the kind of games that have been keeping me interested. I recently revisited Jet Set Radio on XBLA. I loved that game when it first came out, and I was like “Oh hey, it’s there!”, and I bought it on a whim, and I’ve been just ploughing through the whole game, remembering how great it is. Which console reins supreme in your households? Bruner: It’s a fight between the PlayStation and the Xbox. Boyle: But we don’t have to choose! But I think, you know what, there are points where I do have to choose, and that’s when you get into console exclusives. Because I know at my house, you know, you’re not going to be playing LittleBigPlanet Karting on your Xbox, or Mass Effect 3 on your PlayStation, and so that’ll be the thing that divides. But I find I rotate pretty effectively between mobile, PC/Mac, and PS3 and 360.